Is It Really Possible For An Amateur Woman To Ride With Fluidity Without Years of Stretching, Fitness, Effort or Practice? Why is it that some riders float effortlessly on their horse, while others are tense and crooked year after year - or worse - get stuck on the same riding plateau forever. If you’ve ever struggled to ride with excellence and flow, this will be the most important letter you ever read. Is there a part of you that remembers the ease of riding as a youth, but are frustrated because you no longer have the brain-body connection for flow and timing? Is your horse happy when someone else rides him, but unhappy when you do? Do you ever feel old from stiff and creaky joints and muscles, and it takes the whole ride to loosen up if you do at all? Do you ever wish you could stop overthinking and ride with relaxed attention so you can improve your scores? Are mounting and dismounting painful and worrisome that you may actually fall? Have you ever felt discouraged because you feel that the years have taken their toll on you so riding with fluidity just simply isn’t possible? Do you want to know how to ride with excellence, ease, and flow so you can enjoy a sense of accomplishment each and every ride? Can Riding with Fluidity Really Be Taught??? The short answer: yes. For the past 7 years, I’ve been helping women riders master the invisible and highly prized riding qualities such as fluidity, ease, and flow. Plus, skills like relaxed attention, relaxed action, and balance. As a Guild Certified Feldenkrais PractitionerCM I’ve been able to help women move effortlessly without additional exercise regimens, stretching, or trainings. Like many women riders, I returned to the saddle after years away. I rode as a young girl and when I took riding back up as an adult I quickly realized that the girl of my youth was now a mature woman in a very, very different body. Years of sitting at a desk, surgeries, sprained ankles, a broken arm... had me making compensations in my movement that made my riding awkward and crooked. I signed up for more riding lessons. I gave my all, but my riding remained mechanical and stiff to the point that riding really just became an exercise in frustration. I was ready to quit again! I learned there is a whole world beyond fitness and bio-mechanics when it comes to riding, I discovered a step-by-step system for effortless movement. I went from complete inability to sit the trot to thinking nothing of it at all! All of a sudden I had quiet hands so my horse could soften and round. I could hardly believe it! Other instructors wanted to know who I was riding with, some implied that I was an instructor (even though I wasn’t yet!) and they all wanted to know what my secret was. Now, after helping hundreds of women over the past 7 years capture ease and flow on their horse, I can confidently tell you that if you're feeling frustrated and stunted in your riding, you're not alone. It’s completely normal. In fact, from my work with women riders I know that there are 3 stages and 1 secret to be a flowing rider, when you don’t have them, keep you from fulfilling your dream of riding in a way that your horse loves and helps him do the job you are asking him to do. Watching kids on any playground in the world shows how effortless we all moved at one time - going from running to skipping to hopping without a thought. So what happened, where’d that girl go? The trouble comes in when this awkward way of moving becomes habit…. then we get into the saddle with this unproductive and undesirable habit and struggle to understand why there is such a huge gap between the way you ride and the way you want to ride. Effort, fitness and practice are the common approaches to riding, but here’s why they are so ineffective, they do not get to the root cause of the problem, they do not teach how to create a way of riding that is effective and elegant. Doubt it? Check every book, watch every DVD, ask any instructor for a lesson in fluidity - I’m positive that you’ll not find a one, that you’ll be looked at like you’re crazy, and that told that it takes years and years to develop. So decades go by, effort, time and money invested, but here’s the thing, fluidity can be taught…. and there are no more decades to wait. That’s when I knew I couldn’t keep this to myself. I had to share it. People clearly wanted and needed my help. So I decided to create “The Flowing Rider Program,” to support women riders and help them effortlessly ride with ease and fluidity. If you want to master fluidity, I have a special invitation for you. I’m so committed to helping women horseback riders have effective skills with the highest level of quality that I’ve created a program specifically designed to teach you how to ride with fluidity. This is your DEEP DIVE into Fluidity. You’re going to walk away from this program with the rare ability to create lasting ease and flow in your body and fluidity in the saddle so you can ride with a greater grace and joy that your horse will value and appreciate. Why Most Riders Stay Crooked In The Saddle… And The Small, Simple “Shift” That Completely Turns Your Ride Around! In this unmounted and mounted program, you learn what the common denominator is between Balance, Calm and Fluidity, and how to turn this knowledge into skill so you can have the deepest confidence and create a rewarding, meaningful ride with your horse each and every time. In the “Creating Ease” module, you’ll discover the connection between balance, calm and flow; and the 2 simple steps to create lasting ease and flow on your horse no matter how old you are! In the “Lasting Calm” module, you’ll find out why common strategies used by most riders for calm can actually increase anxiety, and demystify calm and make it your forever. In the “Effortless Balance” module, you’ll discover what ancient structures have to teach about being centered and soft in the saddle, and how to easily create a truly balanced seat without stretching, building strength, grit or determination. In the “Art of Fluidity” module, you’ll discover the #1 myth most every rider has heard that actually makes you stiff and rigid, and how to turn that around to be the elegant rider you have always dreamed of. In the “Long Swinging Strides” module, you’ll discover the #1 fastest way make your horse tense and crooked and how to turn it around, and learn how to replace hours of practice with efficient learning curves so your horse can carry you with ease as you cover the ground together. In the “Sit Quietly” module, learn #1 secret to a flowing seat to enjoy excellence in your riding for higher higher scores and faster times. Book your sessions anytime during 2018, and get a downloadable recording of each so you have them in your library of valuable resources forever. OR 6 payments of $269! As I mentioned already, this Program is extremely powerful. Even more so right now because this is the first time and perhaps the last time I will offer this Flowing Rider Program live. You can come to the live calls and ask me any question, I’ll work with you live to help you around creating fluidity and taking it into the saddle with you, and anything else that comes up for you while we’re working together over the course of the next 12 months. This is a rare opportunity, it is the only program available in the world to teach you fluidity in riding, and it may not come around again for a very long time, if ever again. We begin in January. Frankly, if that’s you, I want you in the program. You are my kind of woman and you’ll be an amazing addition to the group. The bonds and friendship you create inside the program will last a lifetime. When you ready, click the payment option that works best for you and let’s get you in the group! Your investment today is just...one payment of $1497 OR 6 payments of $269! If you’re really serious about balance, calm and fluidity in your riding, and becoming a skilled rider that your horse can look to with trust, and you don’t want to look back in a year and think “Gosh, I wish I had taken a chance last December when I almost registered for The Flowing Rider Program...I can’t do this stiff, jerky, working hard and not getting anywhere thing anymore...I’m just so frustrated.” The time is now. What would you think about you if you hadn’t made this change? I want for you what you want for you. If riding with complete ease and flow in all the gaits is what you want, I encourage you to join me inside The Flowing Rider Program. We’ll go through the steps together. I look forward to getting to knowing more about you and supporting you along this beautiful, amazing journey. 2 hours per month. This allows you to fully participate in each of the 24 masterclasses. 3 hours (3, 1 hour sessions) over the year for your 1-1 private sessions with Heather. You can watch the masterclass recording as often as you want to over 2018. You have lifetime access to the recordings of your private session with Heather to revisit whenever you want to. You have lifetime access to your bonus program “Balance, Calm and Fluidity” to go through at your own pace. What if I can’t come to the live classes? I’m dealing with pain from arthritis...I’m not flexible...I’m not in shape...can I really do The Flowing Rider Program?YES! In fact, this program is perfect for you because it will bring you the best functioning possible for your situation, and may very possibly get rid of you pain entirely - I can say this because it has for dozens upon dozens of women riders just like you! I have knee replacement, hip replacement, various plates and screws...can The Flowing Rider Program really help me? YES! Bring your hardware because many, many riders before you already have. You will walk away with the best possible outcome of mobility and stability from the program. Below you can read about Judi Qualls, who had ankle replacement, and hear what she gained from working with me. You’ll receive an email from me with all the details for your Flowing Rider Program...the masterclass schedule, the links to join the classes in person, how to access the recordings and class materials, how to schedule your private sessions with me, join our private Facebook group...all the juicy stuff. You’ll also receive a second email from Active Membership 360 to provide you with your login credentials.From there, all you have to do is enjoy your classes and what your horse has to say about the new you! Will this be offered live again? I am not planning at this time to ever offer this live again. “Before I starting working with Heather, I was dealing with an old ankle injury and the surgery that came with that. 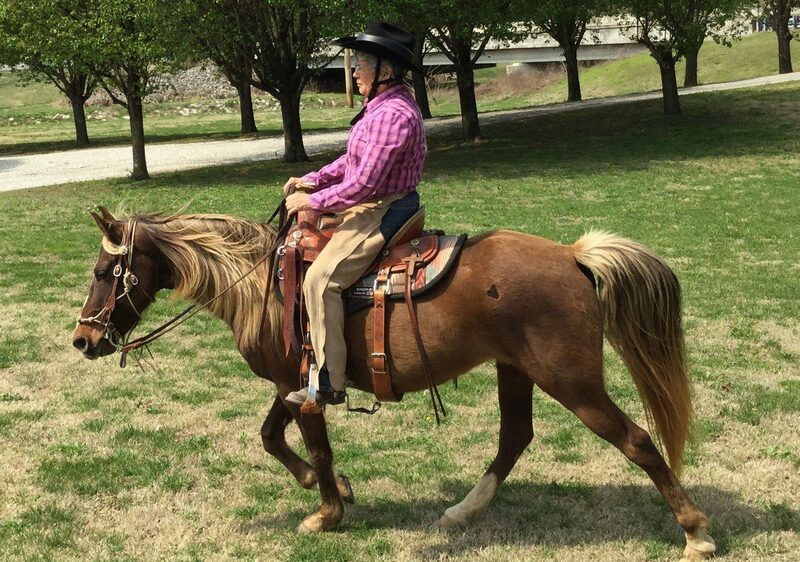 I have done physical therapy, but I was still weak, and rode crooked in my saddle. "I got my first 'flowing, forward and round!'" "I was so surprised with how quickly my riding changed!" 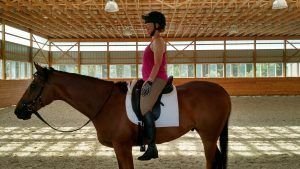 "Before I started Heather’s program I was dealing with several horse-related injuries, an ankle replacement, and some fear issues around cantering. 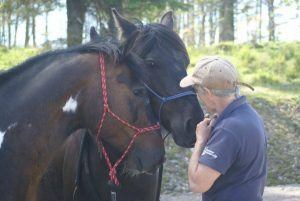 I have a wonderful horse who takes such good care of me and I knew my issues were with me and not her. My instructor would tell me that being relaxed was my biggest problem, and I would try so hard to be that way without much success, and would get so discouraged. When Heather offered a balanced and relaxed course I decided to try it and see if I could find some help. I discovered that there so many places to hold tension in your body, some I just never realized. At first I was skeptical of some of the exercises. I thought they’d never work, but they did! The changes in my riding happened quickly, and my instructor was so thrilled I was being more centered in my saddle and that my hands were getting more quiet. I found myself not worrying so much and instead I could focus on where I was holding tension and release it. I just did an obstacle competition and it was so great to just stop at each place and know exactly how my weight was balanced in my seat, where my legs were, my feet in the stirrups and where my hands were. We got great scores!And I never felt rushed. I plan to ride a lot this spring and summer and will be listening to my mounted sessions as I go along in my riding. Thank you, Heather!" “Before working with Heather, I was not confident and had not been brave enough to canter at that time, felt stiff and wasn’t moving with my horse at all unless I forced it, and I had a lot of back pain. After one class with with Heather my back wasn't hurting, and rarely bothers me now. 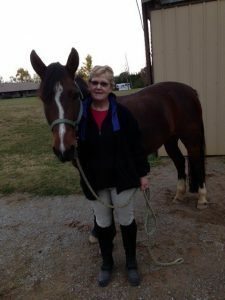 And, much to my surprise, after a couple of weeks into the course, I melted into the saddle, moved with my horse and felt better than I ever remember in the saddle. It just happened. No thinking about it, or straining to do it. 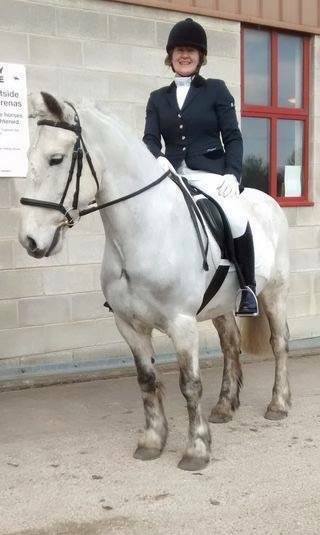 "I have greater self-confidence and my horses are happy..."
"I'm cantering happily and making steady progress!" "Before I started working with Heather, I was held back in my riding from tension trying to hold myself in place,holding my breath, and a fear of falling. I was taking lessons with excellent instructors, riding regularly,working on my physical fitness, particularly my core, but the improvements were minimal, at best. Since I've been working with Heather, recognize how I've been fighting myself and not even knowing it, and Now, I’m cantering happily and a lovely circle!!!! I LOVE it! Also, I have rediscover balance and relaxation in the saddle, and with it, my joy of riding. My new accomplishments bring respect to my horse’s body and mind, and we are now making steady progress together. Heather has helped me in a way no riding instructor ever has! Thank You Heather!" "After just a few weeks I was able to sit the trot with a deep balanced seat!" 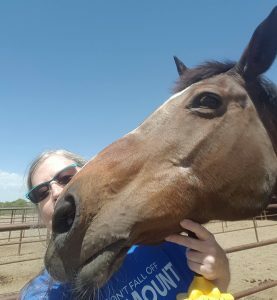 "Before working with Heather, the judge’s comment was: “The basics of rhythm, relaxation, and contact are lacking.”I realized that I needed to address my inability to relax in the saddle, before I could fix the other issues. Then Heather taught me how effortless movement is found and applied to my riding. After just a few weeks I rode for the same judge, and was able to sit the trot with a deep balanced seat! That allowed me to focus on developing a more supple connection over a rounder topline. 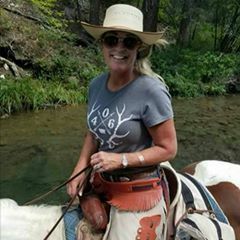 Thank you Heather for helping me relax in the saddle and enjoy every ride!"